The Campus Loop shuttle is a nightly continuous shuttle that runs through campus seven (7) days a week with extended service on weekends. The Campus Loop’s first stop is the Tyler Haynes Commons and the last stop is at Whitehurst off Richmond Way. The shuttle services the campus every 30 minutes leaving the Tyler Haynes Commons on the hour and half hour. Below are the stop locations in order of the shuttle route. 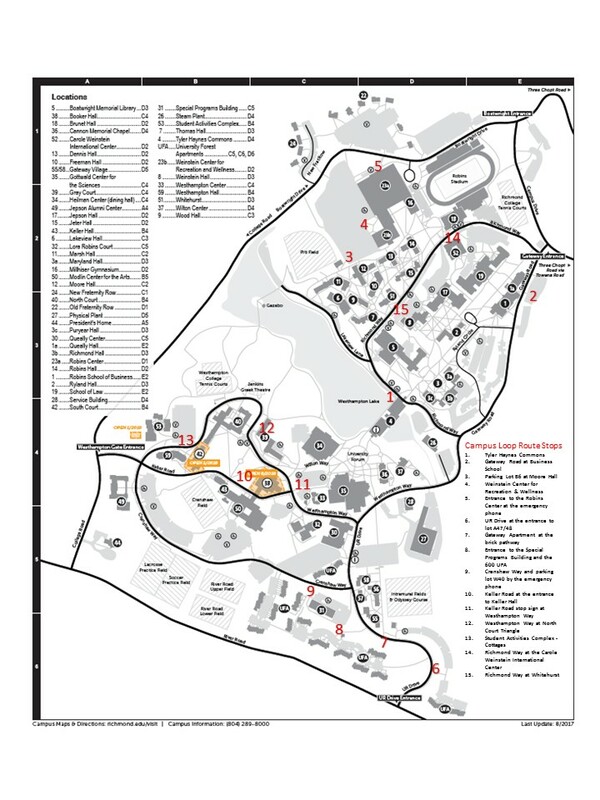 Click here to view Campus Loop route on the campus map. **The Bostwick Lane stops is by request only and will be made after the Gateway Road/Business School stop. For services to or from this location, please call the University Police’s non-emergency line, 804-289-8715. The University of Richmond's bike share program was launched in 2009, in an effort to provide an alternative green form of transportation, lessen on-campus traffic, and minimize our carbon footprint. Students, faculty, and staff can use the University's beach cruisers to travel from various campus locations. Riding is free, and you can pick up and leave the bikes at racks placed throughout campus.